I-35 goes down to a single lane in each direction for a few miles between Rush City and North Branch. In the lead up to the merge, MNDOT has installed signs that clearly state to use both lanes when traffic is backed up. They do this because they’re reminding people that the zipper method is the way to most efficiently move traffic through bottlenecks: continue in both lanes of traffic up to the point of the merge, then take turns merging. It’s not a particularly difficult concept (it can be explained in a sentence, or even more concisely on a traffic sign), but that doesn’t stop Minnesota drivers from screwing it up. That brings me to this past Friday, where I experienced driving illiteracy first-hand. As traffic began slowing down, MNDOT started publishing signs that the left lane would be closed 7 miles ahead, then 6, 5, etc. That, apparently, was the right time to move to the right, according to people who couldn’t comprehend what “USE BOTH LANES” means. 1. Some would drive in the right lane and swing to the left to block literate drivers from continuing to the merge point. I’ve found that this type of driver is easy to get around as it become more and more clear in their mirrors that I won’t be slowing down when I get to them. While based on poor understanding of road signs, the behavior is rational. If people pass you, they’ll surely lead to further delays through the merge point. 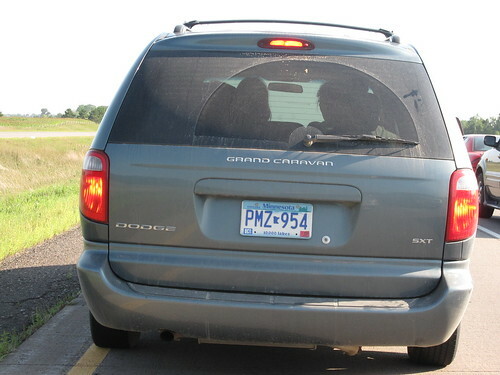 This illiterate driver, rather than sit in the right lane and block out drivers, chose to drive in the left lane and maintain a steady pace next to a car in the right lane, thus shutting down one of two lanes on an interstate highway. While the right-lane-swayer’s behavior seems rational since the driver is trying to save time, this illiterate driver proved that she has no respect for the time of people behind her, her passengers, or her own time. Yes, she is at a dead stop with over a mile of open lane in front of her. She’s riding the yellow line because a driver did manage to get around her by driving in the ditch. This “take turns” technique, known as the zipper method, is used when traffic is congested. In this instance, drivers should use both lanes all the way to the designated merge point and then take turns merging. Drivers are also reminded not to play vigilante by blocking or denying access to other drivers who are using the other lane of traffic prior to the bridge. Minnesota State Patrol officers will patrol the work zone to enforce traffic laws and respond to incidents. Extra law enforcement throughout the construction zone will increase safety for the traveling public and construction workers on site. Drivers also are reminded that fines are doubled for infractions in the work zone. Frankly, I’m not sure why I just wrote this. Someone literate enough to read a blog is certainly literate enough to understand what “USE BOTH LANES” means when they see it on a traffic sign. Perhaps this could be a motivator to reach out to illiterate friends, neighbors, aunts & uncles to explain the concept? Together, we can make Minnesota’s roads more efficient. The MNDOT release mentions ‘the designated merge area’, which they must think is clearly where the barrels and flashing lights are narrowing the road down to one lane. I’m guessing it is not so obvious to drivers though. Also, I’m guessing the State Patrol being there would only give comfort to the already confused single-lane-for-miles drivers as in their minds the patrol would force people to merge earlier. There is definitely a need for true education on the zipper approach. The underlying problem is people’s inability to give any space and take turns out of some grade school fear of losing their place in line. I blame elementary school lunch ladies. I’m chuckling, but actually I’m serious…in these merge areas, all the cars are compressing in too tightly, which makes it impossible to do the merge (zipper or not) at any decent speed, and as soon as the speeds go down the volume of congestion increases. People are working against their own best interests by using their 4th grade lunch line approach on these construction zones. They need to fill both lanes loosely and as the ‘designated merge area’ approaches they need to position their part of the zipper in the gap given by the other lane, and if people do this well, traffic shouldn’t have to stop near the merge area. Glad to hear there are signs now but I’m one of the drivers who used to block the left lane because before they had these signs you had one long-assed line being slowed down by testosterone-fueled assholes who’d jet down the left lane to forcibly merge into traffic ahead of people who’d been inching along more slowly than necessary thanks to disruptive left-lane mergers. Save your outrage for MnDOT which easily has the WORST signage and signage placement of any state highway department in the nation. You want zipper merging? Don’t post ANY “left lane closed X miles” signs until you’re half a mile from the merge point. I’m glad to hear that there is “zipper” signage now, but from your description it’s clear that this is yet another MnDOT sign FAIL. In all candor, the only way you’ll straighten out this and other MnDOT enhanced driving clusterfucks would be to have the Governor include ten minutes of driving instructions in his next State of the State message delivered in TV friendly soundbytes. I’ll go you rant for rant on this one Ed. After spending twenty years getting paid to generate telegraphic language for resume clients, I know signage ambiguity when I encounter it, and MnDOT is the Spamford Wallace of confusingly ambiguous signage. One other point. Signs only work when EVERYONE understands them. Signs that fail to communicate universally are worse than no signs at all. Redirect your rage from innocent, well meaning drivers to the idiots who get paid serious bucks to develop signage that confuses the hell out of people. 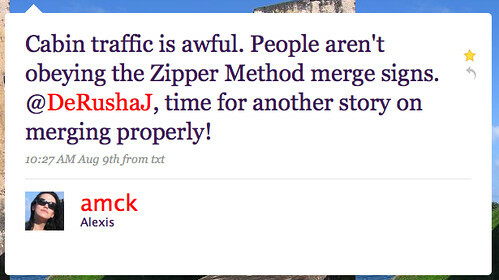 And The Other Mike is 100% correct that once traffic slows to a crawl, the zipper method backfires. Once traffic has in fact slowed or stopped, merging should take place as far from the lane narrowing as possible so as to allow traffic to keep moving. I’d just lay on the horn until the person gets the point. No sense trying to convince people the right way to drive. Zipper method is in use because it limits the affect of the bottleneck to the least amount of freeway. I personally hate “snarfers” the jerkoffs that drive all the way down to the last 1/2 of a merge and then jackhammer their way in. I find that a random turn signal and a quick foot or so dart out towards the empty lane seems to keep them on their toes. I suppose in reality it’s not 1/2 mile I have no problem with thta its more like 500 feet. had to drive through the i-35 construction on the way to/from the range this last weekend. it was incredibly bad on the way back. the “use both lanes” signs *are* a great idea, but it appears that many drivers just don’t know how to merge (also a problem on highway on ramps). i have a feeling that the “project funded by the american recovery and reinvestment act” signs might actually turn people *against* the program as they wait and wait, and waste gas while moving through the construction. Ok so for everyone who doesn’t know this….the Zipper Method is not new, and is taught in many Driver’s Education class. Maybe too many people couldn’t manage to pay attention in class long enough or read the text book/manual so they missed this valuable piece of information. And to those who think that blocking the second lane is “correct” or the “right thing to do” or “fair” your the person (idiot?) that merged 2 miles (exaggerating here) before you had to and are contributing to increased traffic jam this causes. @bob, my guess is that the number of cars heading single file through an opening isn’t going to vary much whether they have a rolling start or not. However, the chance of an road closing accident in the merging zone is much higher if you have cars nearly parked in one lane while people fly by in the next, followed by vigilante blocking. If both lanes approach the opening, then zipper, things are safer. Clearly, if traffic is light enough for everyone to merge while maintaining higher speeds, that will make this discussion mute. The people of Minnesota just need to have a little respect for each other on the roads and not be in such a hurry to cut others off. It’s the basics of driving…and sometimes I wonder if Minnesotans need to go back to driving school. The problem is that people like to budge eachother and when there is a clear lane people will use it because the dont want to be budged themself. MnDot puts out something like the zipper merge and you will have some people will understand and others that will have never heard it or cant comphrend plus even if we unform the whole state, people from other states will be un aware and when they drive they wont do it. So its kinda a whole fail. Will take years for us to really get this down and thats only if we practice and do it now. Zipper Merge is a flawed theory that assumes cars can continue driving with zero following distance after merging. Since that’s false, cars have to slow down to allow proper following distance. As Bob says above, it’s more efficient to merge in an opening that doesn’t require anyone else to slow down, even if that occurs before the “zipper” point. The zipper merge won’t work until every car on the road is automated instead of having human drivers. @Justin, I think the zipper method assumes that traffic WILL be coming to a halt. Once that situation is reached, is it safer/more efficient to zipper or have people competing/merging between two lanes at vastly different speeds? intelligent drivers at control lights both lanes would be equally full and merging as planned…you never see Xicks at control lights trying to force everyone into the right lane. so if your so stupid as to not get the idea just stay in the right lane and let smart people pass you in the left. is a std morning commute and use both lanes. I slow down just not to a crawl, I dont barge in I wait two to three cars and drift in as one should at the merge point. @Ed, I can’t deny that it works *if* traffic in both lanes has come to a halt. The problem is that people use that as an excuse for bad behavior when traffic has not come to a halt in both lanes. @Justin, great point. If people took more of a hypermiling style approach to driving by looking more than 10 feet ahead of their hood, they could help soften the dangerous slinky effect we often see today. I am a proponent of the zipper merge but by taking two more steps it could be made to work even better. First, don’t post which lane will close. This would keep drivers from merging early. But more importantly, don’t close one lane or the other. Use cones to truely funnel the two lanes down to one down the center of the road. Then move that lane to whichever lane will remain open. This would eliminate road rage by not letting drivers in one lane think they are in the correct lane and other drivers are in the wrong lane. This would result in a real zipper. A couple weekends ago I saw the worst example of this ever. I was going north on 35E and MNDOT had signs up about a left lane closing ahead. People started merging over to the right and traffic came to a stand still. Up ahead two semis were rolling along next to each other, the one in the left lane blocking traffic so no one could do the zipper merge. We slowly moved forward for a mile or two and then it became clear: There was no left lane closure. We were sitting around for nothing. Thank you lane blockers. @Kevin, this state has an inordinate number of self-deputized drivers. I just linked to this since the traffic situation is now hovering around Forest Lake and I must commute in it and you write about it so nicely. Merging I don’t think Minnesotans know the word. I was ran off the road this morning by a woman in her SUV because she wouldn’t let me merge before my lane ended, she would slow down, speed up, then in my lane only inches from my car and steady if I sped up she would and then slow down. I finally got behind her when she would slam on her brakes and then let off over and over. I then laid on my horn and thre my coffee at her, I pulled off the highway as did she on her phone with the police. Even tho she ran me off the road using her car as a deadly weapon and not merging I got a fine and possible jail time because I thre coffee at her vehicle. What a joke, so because you are in a brand new SUV you think you own the road. I’m going to fight this, the police officer said that MN has no laws in merging. So you can use your vehicle as a deadly weapon because you don’t have or want to merge? ?